We dragged ourselves out of bed at an ungodly hour for a second day in a row, as we were getting room service breakfast delivered before we head out for a droning session. Only thing was... the rain from last night never stopped, and the skies were still dripping at 6 a.m. Damn. Of course, room service arrived on time, and we asked our butler to lay out the spread on the daybed under the gazebo. While the weather was crap, we could at least enjoy the morning breeze and listen to the rain while we ate. 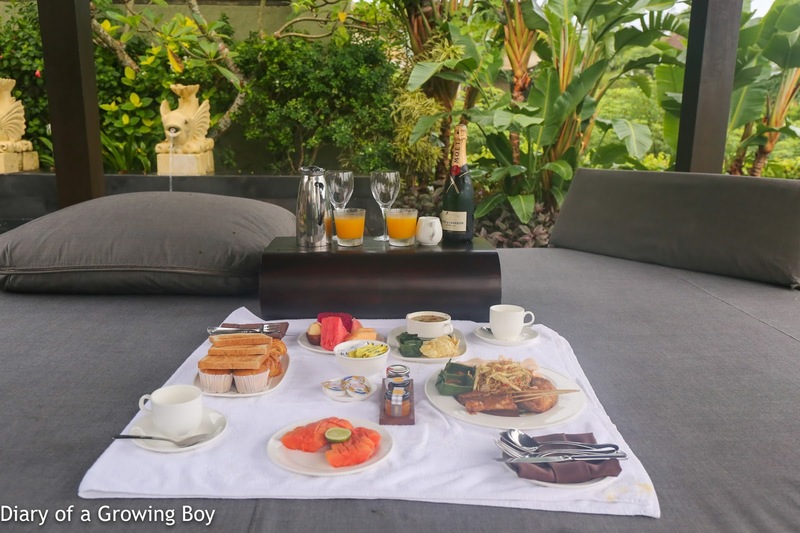 Out of the available breakfast sets, we chose the continental breakfast with its basket of viennoiserie, as well as the Indonesian breakfast for soto ayam and mie goreng - which was changed from the original nasi goreng. But the real reason we ordered room service breakfast was for the orange juice. You see, Diva had gotten a bottle of Moët et Chandon Brut Imperial as a gift from one of his vendors. He didn't want it, and couldn't be bothered to lug it back to Hong Kong if he wasn't gonna drink it, anyway... So he left it with Hello Kitty. Well... I decided to channel Andy Hayler from his opening scene in Foodies and told Hello Kitty that the only thing that bottle was good for was to make Mimosas... So there you have it. I popped open the Moët and made us Mimosas to go with our mie goreng. I was one-upping Diva on wine snobbery. The rain kinda let up a little by mid-morning, so I re-booked a driver after cancelling on him 2 hours earlier, bid farewell to the birds chirping around the trees and bushes on the grounds of our villa, and checked out of Ayana Resorts and Spa. I got me some droning to do! But Operation Uluwatu ultimately failed, and it was starting to drizzle again, so I called my DJI Mavic Pro back, packed up, and headed back north for lunch. I's gonna git me some pork! 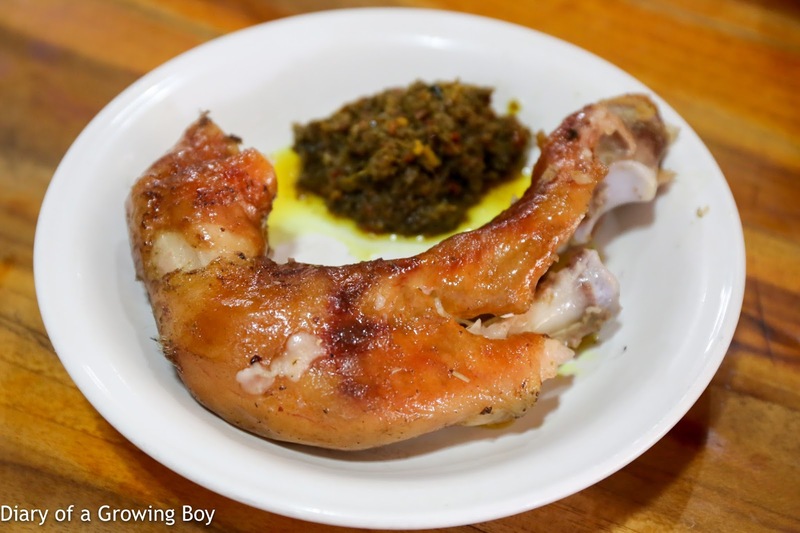 Being a long ways away from Iku Oka - my old favorite joint for Balinese babi guling - meant that I needed to find an alternate venue on the south side of the island. Some of the recommended joints I found after some research, unfortunately, don't open until dinner time. So we ended up at Warung Babi Guling Candra in Kuta. This is apparently a local institution and not one frequented by tourists like ourselves - something we confirmed for ourselves when we arrived at the restaurant. There was, of course, no menu available. I was momentarily confused about how I should go about ordering, and eventually just walked up to the group of ladies busily plating food and stuffing takeout bundles. I decided to point at all the different parts of the pig I wanted to eat, and this was just about everything that was on offer. 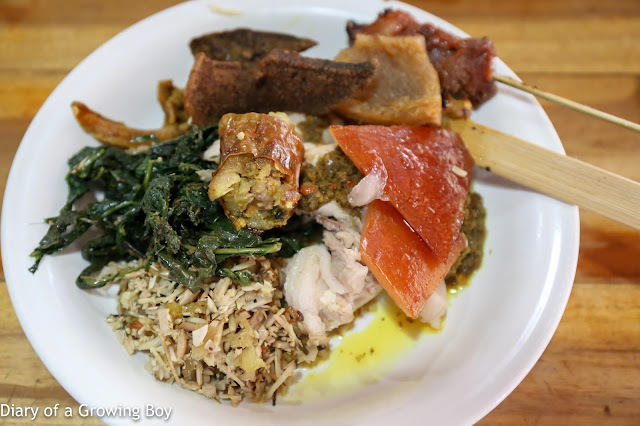 Aside from the tender and succulent (not to mention fatty) pork, there were pieces of crackling, a section of a fatty sausage, two different types of satay, tasty deep-fried intestines, what seemed to be dry and tasteless hardened liver, plus some stewed vegetables, lawar, and sambal. The sambal definitely packed some heat, and soon I was sweating and sniffling a little... but it was pretty damn good. I wasn't expecting soup, and this was by itself a little peppery. 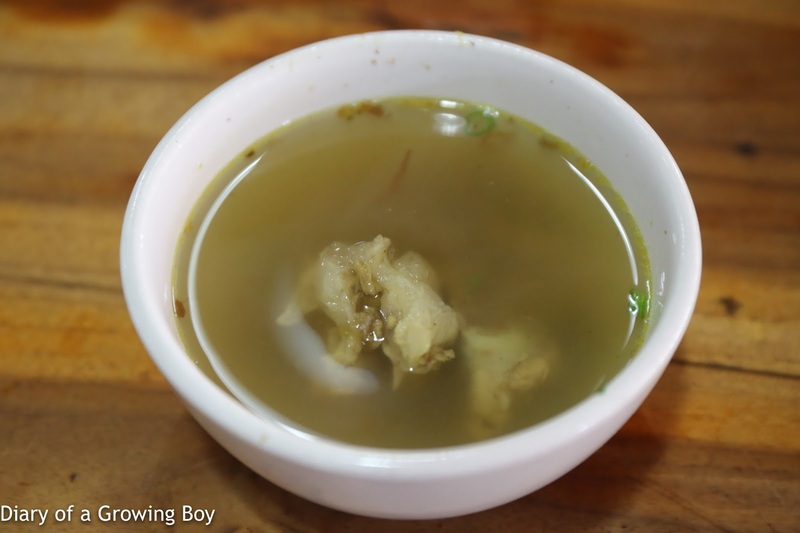 Drinking hot soup while my tongue was on fire from the sambal was like pouring gasoline on top. As I was doing the ordering, I noticed a big bowl of trotters, and decided to get one for myself. Yes, I'm greedy like that... and I can never resist gnawing on these little trotters with their crackling. Unfortunately, though, the crackling was no longer crunchy... and became pretty tough to handle with my teeth. We headed to the airport after lunch, but not before picking up more babi guling to take on our flights. This was definitely better than any airplane food I was gonna get! My plans, though, hit a snag at the boarding gate. CX very kindly decided to give me an upgrade, and I suddenly found myself sitting in Business Class with a #firstworldproblem... I was pretty sure that the babi guling I had brought onboard would be more delicious than what CX was serving for dinner in Business Class. However, it seemed pretty poor form to suddenly break out my takeout and eat it. I would have done it in cattle class, as I couldn't have cared less about how it looks. But in Business Class, on an upgrade, it suddenly seemed ungrateful.